I thought Japan would abound with origami items, origami displays and adults and children folding origami-everything, everywhere. Was I surprised! 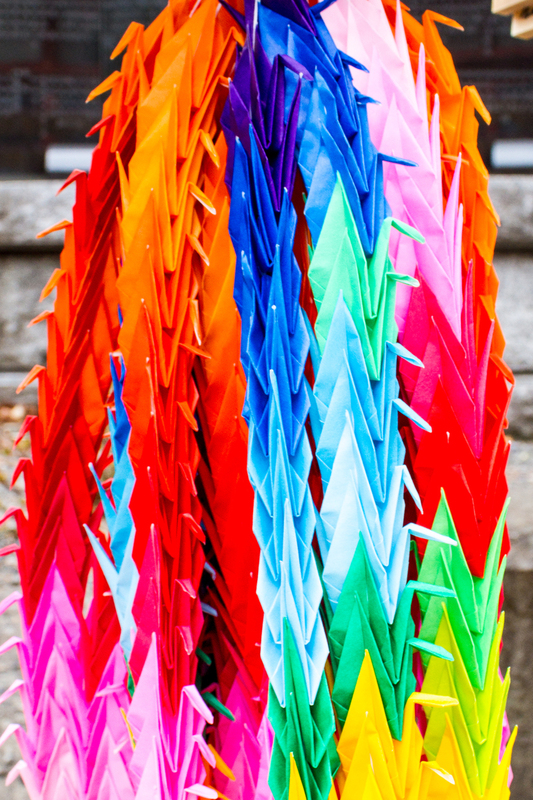 The only origami I saw was a string of a thousand cranes tied to the wooden shrine housing the Miroku Stone at Koyasan. The weight of this stone is supposed to represent the weight of our sins. Each person is invited to try to lift the stone with one hand. The stone will feel heavier the more sins you have. Perhaps the person who left the cranes has some atoning to do. I’m happy to say that we could both tip it up (but not really lift it). On the other hand, we saw our reflection in the sacred well, so, in Buddhist tradition, we have plenty of years left to do some sinning. The other origami I encountered in Japan was a Japanese friend’s hobby. He makes 3-D origami buildings. In true origami form, he uses only one very large sheet of paper without making any cuts to make his architectural sculptures. I was surprised that the Suzuki method of instrument playing for young children is unknown in Japan. Suzuki began his program in Japan in the 1960s but it took off in North America. I had really wanted to experience a class in Japan as my daughter began Suzuki violin at age 4 and progressed very well through the method. 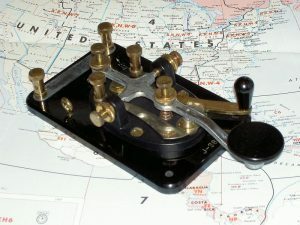 Being a licensed pilot, I was wondering about the Japanese equivalent of the pilot’s alphabet (Alpha, Bravo, Charlie, Delta, …). I didn’t find it. I then searched the Japanese Morse code in which I was also interested. It seemed like an obvious segue. I was so surprised to see over 128 Morse codes based on their language! And that’s not including numbers. Each Japanese letter can be composed of up to 10 individual dots and dashes! It’s a good thing I’m not Japanese because by the time I would finish deciphering a single word, I would have forgotten the beginning of the sentence. Not to mention the idiosyncrasy of Japanese language that, placed at the end, the verb of the sentence is. In other, words they all talk like Yoda. Homeless Japanese people are ever so reverent with garbage. I watched as a homeless person carefully inspected many bags. Garbage is disposed of in clear plastic bags so it makes it easy to see what’s inside. He took what he wanted and then meticulously made a double knot to restore the bags the way he found them. Unlike Ivan and I, Japanese don’t have a preference for old Akira Kurosawa films. And even if they did, I imagine they would never think of watching those films a second time to listen to the Directors notes as I loved to do. There’s so much I learned to appreciate about film-making from Kurosawa, the Master. They love their anime as I do, but I have a special fondness for the older Japanese treasures. The babies here are all tooooo cute and they never seem to cry. I hardly ever see youngsters misbehaving. Mothers seem to have infinite patience with their children. They gaze happily and lovingly after their children, no matter what the child is doing or saying. They offer their undivided attention. I’ve seen only 2 crying babies and 1 toddler pulling at his mother’s skirt. I imagine these 3 kids were just a little under the weather. That gives Japan a perfect score in my book! Of all the random and surprising discoveries in Japan, I never expected to see a specific genre of Brazilian drumming called maracatu. One of the first events we attended in Japan was a Cinco de Mayo festival. After watching a capoeira performance, I casually inquired if anyone knew about maracatu drumming and discovered that the capoeira teacher also had a maracatu band. When I lived in Toronto, I drummed with Nunca Antes, a maracatu drumming troupe. I had heard the infectious rhythm of their energetic beat in my neighborhood late one night and followed the sound to a warehouse. I really missed maracatu and had been searching for it ever since. This was perfect. We drummed with this Japanese troupe one night. During our stay here, we watched their fabulous performances. 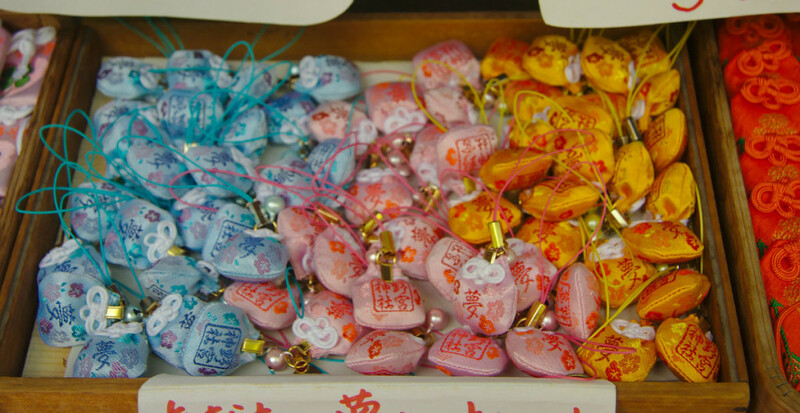 I’m surprised that Omamori charms are not chosen for their cute-appeal. Rather, each has a very specific purpose for personal protection, romance or luck. I’m not really drawn to the talisman type of Omamori. These rectangular ones gain their power from words written on paper or wood. The words may be the name of the shrine, or a section from a sutra. They are then sealed inside a cloth bag that is never to be opened. I would not be able to resist looking inside, thereby forfeiting the power of the Omamori. 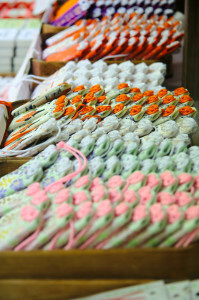 I like the modern Omamori that are very much a part of Japanese culture. Happiness, safety, romance, prosperity, longevity are all important to me, but I’m looking for one that has something to do with a sense of humor and not losing it.